1943 marks an hinge year for the war in Europe. Germany had a severe drawback at the beginning of that year, losing the battle of Stalingrad, with its 6th army surrendering. Germany and its allies suffered 730,000 total casualties (wounded, killed, captured) during that battle; these large losses led to a need to find new troops, and ultimately to the drafting orders in Alsace and Lorraine that started the plight of the Malgré Nous. In May 1943, the German troops and their allies capitulated in Northern Africa. On July 5th, the Germans pushed on the Eastern Front toward Kursk. During the night July 9-July 10 began Operation Husky, the Allied invasion of Sicily, a key island in the Mediterranean. Note the presence of Malgré Nous casualties on each of those fronts. Note also that some of those casualties are far from the front: they correspond to death occuring either in hospital following injuries on the Western side of the Eastern Front, or in prisoner camps in Russia. On July 17th, the Russians started operation Kutuzov, a counteroffensive launched as part of the Kursk Strategic Offensive Operation, near Orel (the main pocket in the middle of the Eastern Front). We note the presence of Malgré Nous casualties all along this Front, including at the siege of Leningrad. In Sicily, the Allies had occupied half of the Island by July 28th, having taken Palermo on July 22nd. At the end of the month, they were pushing towards the Etna. 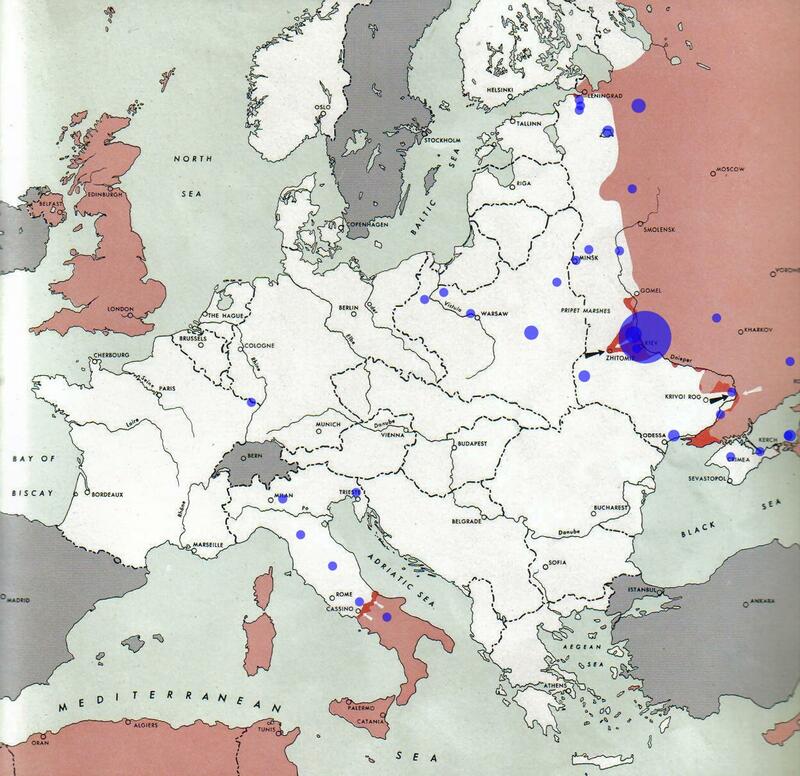 Note the deaths that most likely happened in hospitals as a consequence of injuries, and in prisoner camps in Russia. On the Eastern front, the Russian kept attacking in Orel, trying to push the German away. South of Orel, on August 2nd they started the Belgorod-Kharkov Strategic Offensive Operation, also known as the Fourth Battle of Kharkov, with the aim to recapture Belgorod and Kharkov. 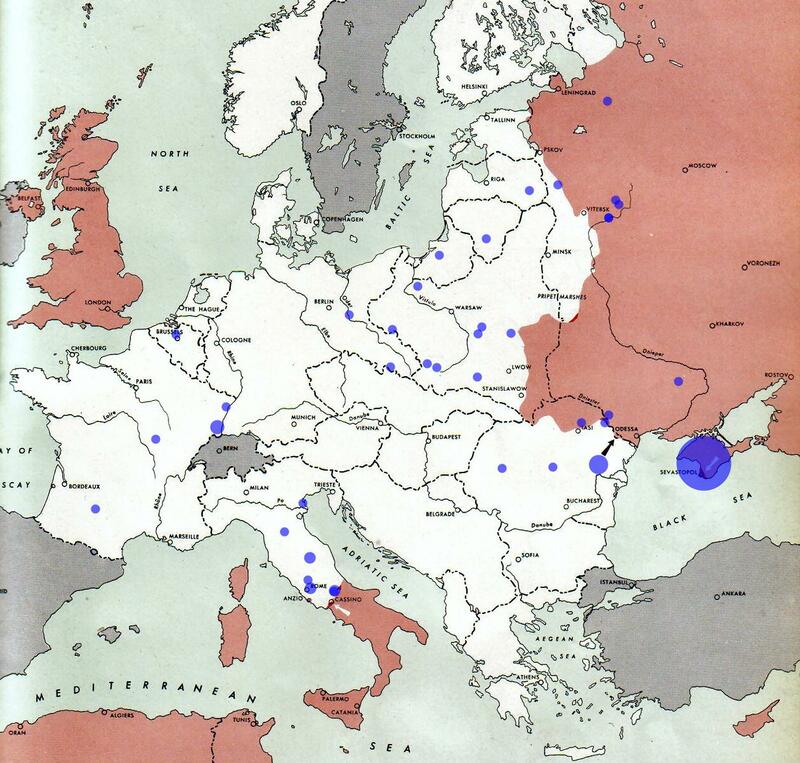 Kharkhov had kept changing hands between 1941 and summer 1943, being at the center of three major battles. On the Western front, the Allies finished their conquest of Sicily in those first two weeks of August. However, the German and Italian troops managed to evacuate with minimal loss. End of August 1943, the Russians started the battle of the Dniepr, that ended up being one of the largest operations in Word War II, involving 4 million troops stretched on a 1,400 kilometres long front, from Smolensk in the North to the sea of Azov. We observe casualties among the Malgé Nous all along this front. In Italy, the Allies prepared to attach mainland Italy. On the Eastern Front, continuation of the battle of the Dniepr between Smolensk and the sea of Azov. The Russians have definitively retaken Kharkov. The German resisted strongly near Poltava, at equidistance between Kharkov and Rostov. On the Western front, the British landed in continental Italy on September 3rd, the same day that Italy agreed to an Armistice with the Allies. During the early part of September, the Allies moved relatively easily North in Southern Italy. On September 9th, 1943, the Corsican partisans, helped by some of the Italian troops that decided to join the resistance rather than support the German after the armistice, started the liberation of Corsica. On 15 September 1943, Hitler ordered his armies to retreat to the Dnieper defence line: the Germans had realized that they could not hold against the Russian on the flat terrain of the Ukraine; instead, they prefer to retreat and fortify ththemselves at the level of the Dniepr river. On September 25, the Russians completed the liberation of Smolensk. During that time, the resistant movements, with the help of troops sent from North Africa, and Italian fighters, finished liberating Corsica (on October 4th) Sardinia also fell under the control of the Allies, albeit without fight as the Germans had left the island for Corsica just after the armistice signed by Italy on September 3rd. 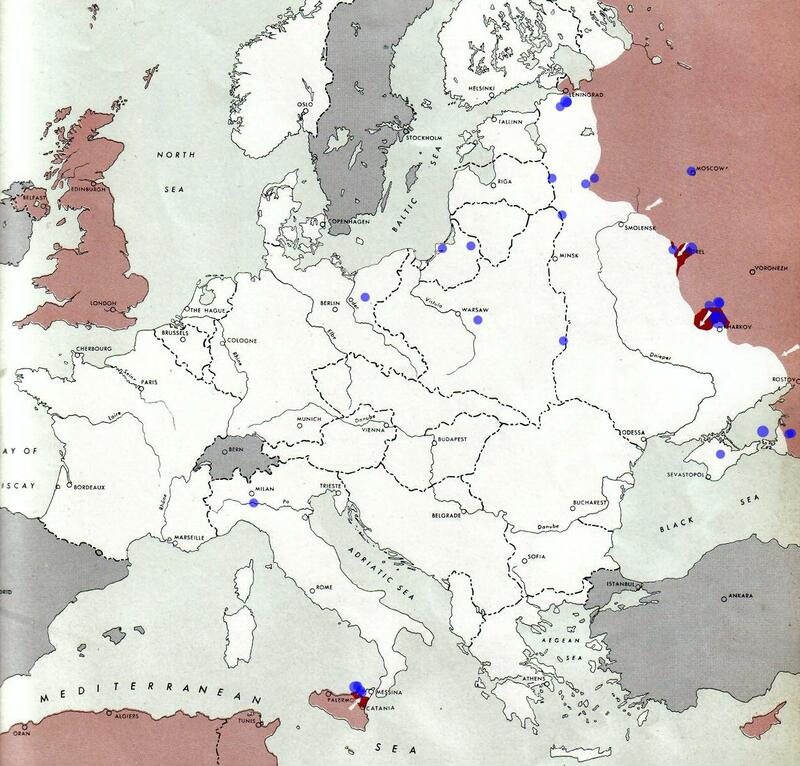 In addition to the large Dniepr offensive, the Russians conducted two majors operations early October. 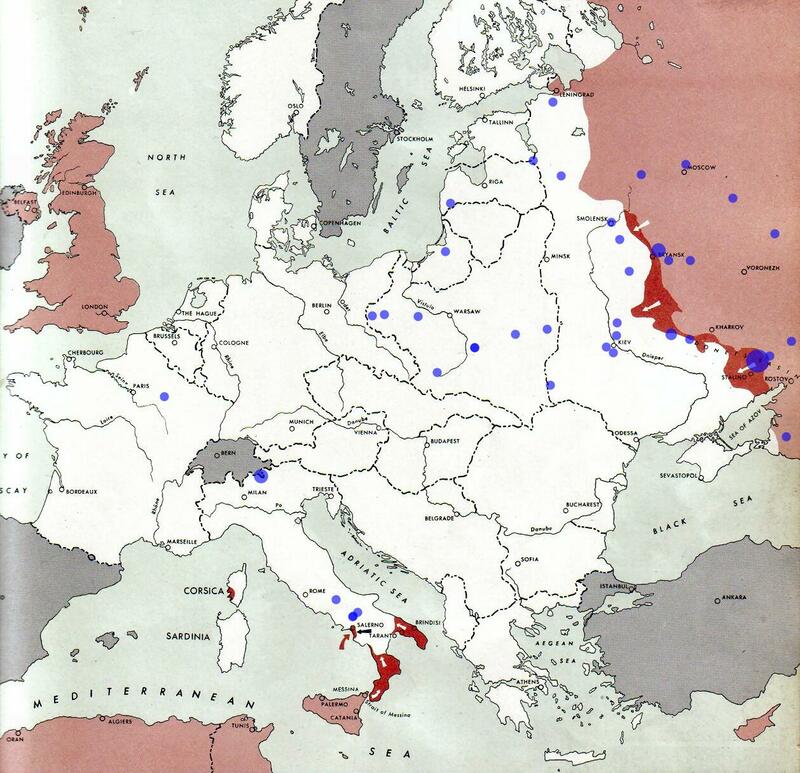 In the North, in Bielorussia, they attacked the Germans in Nevel on October 6, and retook the city of October 8th. In the South, they started the Kiev Strategic Offensive operation, that were to last 3 weeks, with attacks and counterattacks on both sides of the front. 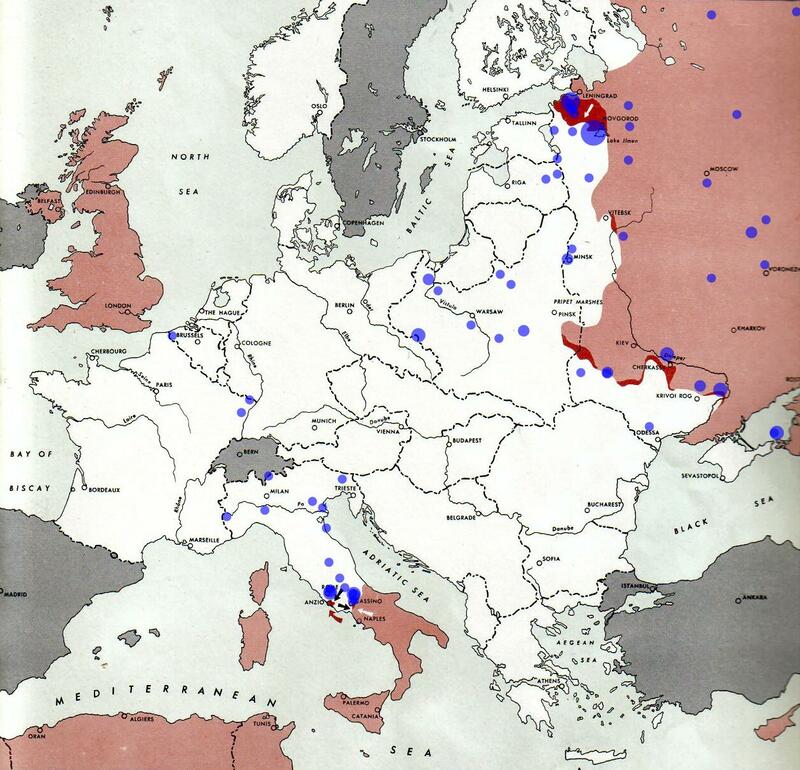 In Italy, the Allies kept advancing North towards Rome. However, Hitler, presuaded by his Army Group Commanders that Italy had to be defended, ordered the preparation of strong defence lines in Central Italy. The Kiev Strategic Offensive Operation was at its height during those two weeks, with the Russians pushing hard to retake Kiev. At the same time, the Russians started a vigorous attack on the Kremenchuk-Dnipropetrovsk line in Southern Ukraine, both for diverting the Germans away from Kiev, and securing the control of the Southern regions and prepare for retaking Crimea. In Italy, the "Winter Line" set by the Germans south of Rome proved to be a major obstacle on which heavy fighting occurred. On the Eastern front, the battle of Kiev dominated this period. Officially, the Russians retook Kiev on November 6th; the fighting however continued for at least four other weeks, leading to heavy casualties on both side. In Italy, the Allies kept pushing along the Winter Line, south of Rome. End of November, the Germans launched a series of counter attacks towards Kiev, retaking the city of Zhitomir amidst heavy fighting with the Russians, mostly through tank battles. In the North of Kiev, the Russians attacked in the region of Gomel, in Bielorussia; the Germans evacuated that region end of November. 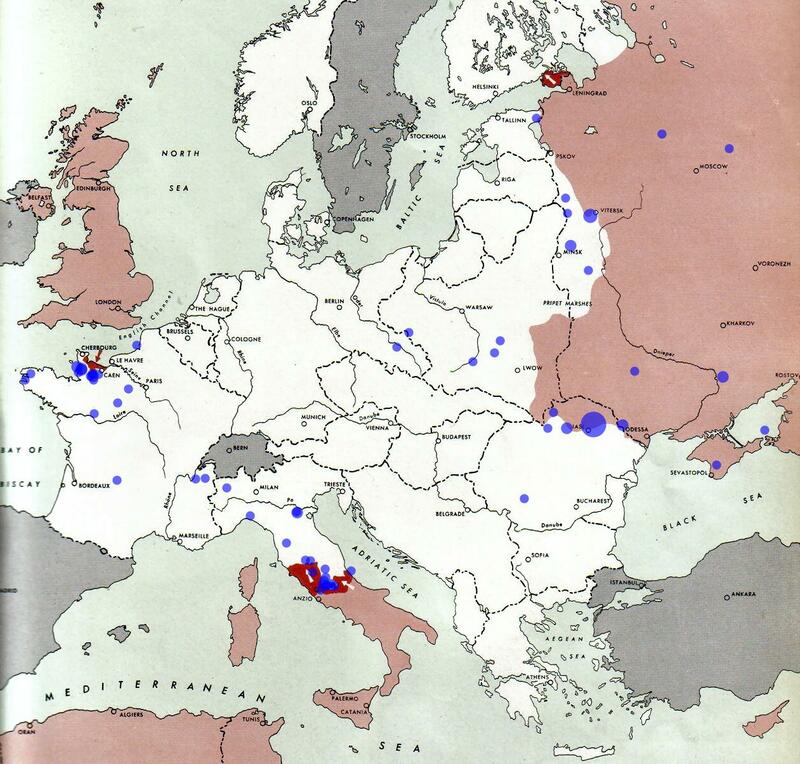 In Italy, the Allies engaged in many attacks along the Winter line. Winter was settling in on the Eastern Front, with ice replacing the muds of Fall, but the fighting did not stop. 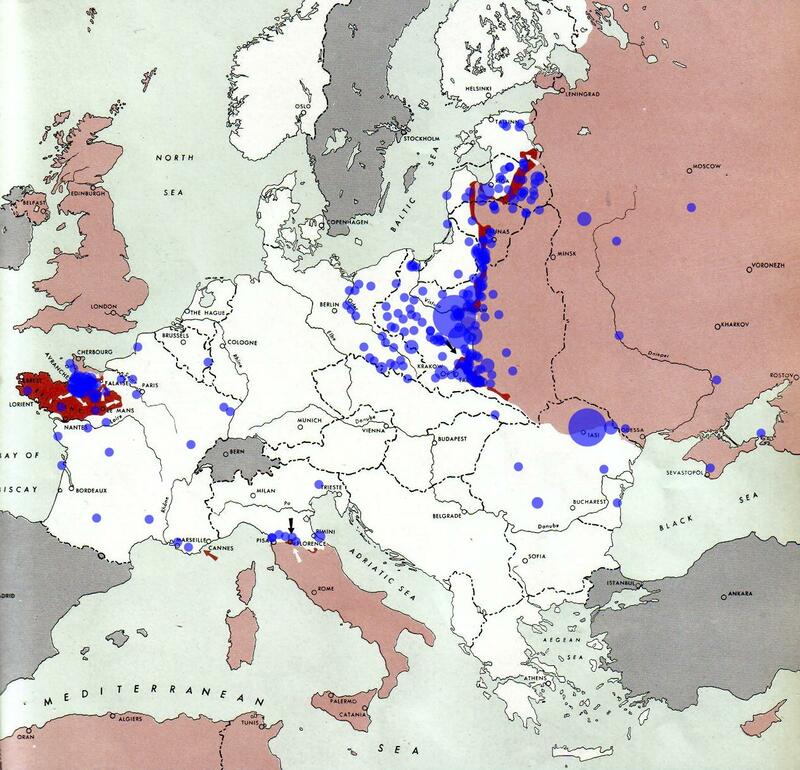 The Germans and Russians were still fighting in the regions of Kiev, Gomel, and in central Ukraine. Just North of Kiev, the Russians started an offensive towards the Pripet Marshes. In Italy, the Allies launched an attack towards Cassino, south of Rome, on the Winter Line, but encountered severe resistance from the German troops. On the eastern Front, the Russians launched two large-scale offensives in late December: one through Zhitomir, the other toward Vitebsk. The former was part of the second stage of the battle of Kiev, with both sides pushing to regain ground. 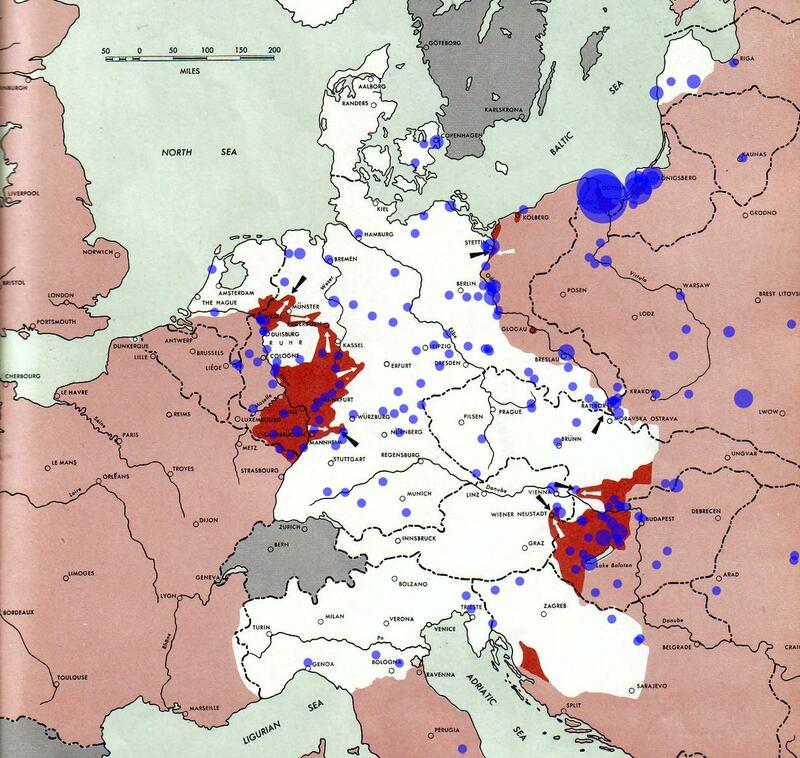 Ultimately, the Germans failed and the Russians secured their control over the Western side of Kiev. The attack on the region of Vitebsk was aimed toward taking Orsha, a major communication node for the German Army in the North of the Eastern Front. In Italy, fighting continued along the Winter line. 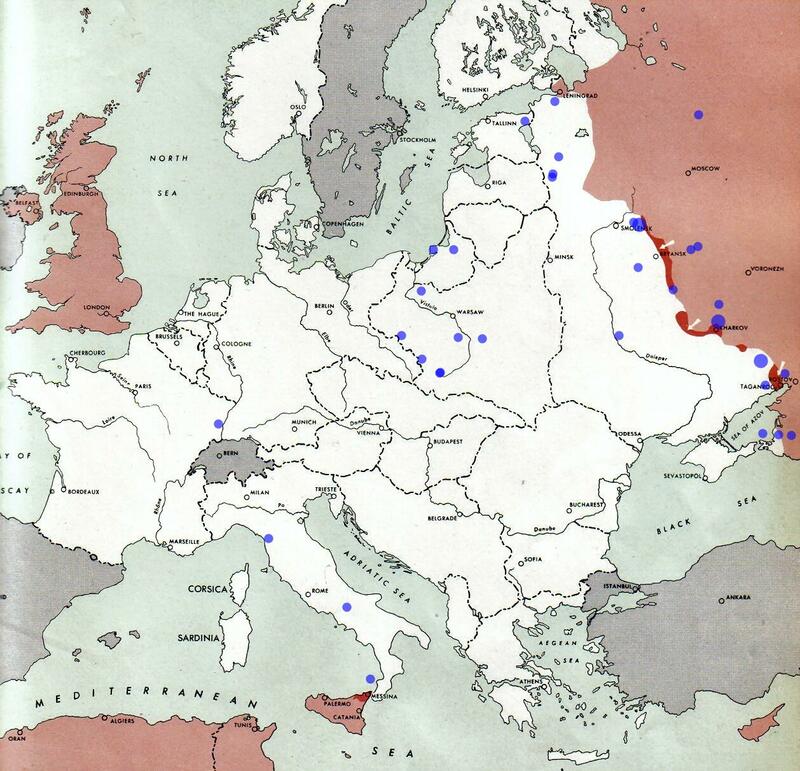 The Russians pushed along many positions along the Eastern Front. 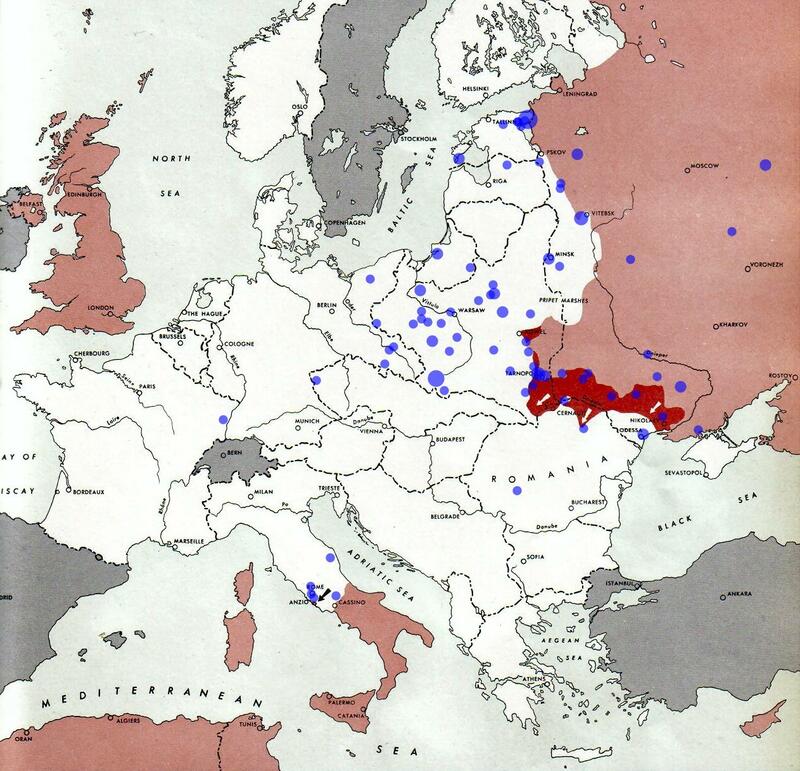 In the region of Vitbesk, they kept pushing to capture Orsha, a major communication node for the German. West of Kiev, the battles net to Zhitomir were still very active. Finally in the South of Ukraine, they started the Kirovograd offensive, to stop German reinforcements in the Zhitomir region. In Italy, fighting continued along the Winter line. The second half of January 1944 saw the end of the siege of Leningrad (on January 27th), when the Soviet Leningrad-Novgorod Strategic Offensive expelled German forces from the southern outskirts of the city. The Germans forces were pushed 60-100 km away from the city. In South Ukraine, the Russians started the Korsun-Shevchenkovsky Offensive on January 24 to continue the liberation of Ukraine. In Italy, the Allies started on January 17 a major assault on Monte Cassino and its surrounding, both by land and through amphibious operations. Allies and Germans sustained heavy casualties during the related battles. As a continuation of the Leningrad–Novgorod Offensive of January 1944, the Russians pushed the front westward to the Narva River, aiming to destroy "Narwa" and to reach Estonia. The Germans however counterattacked heavily, blocking the Russian attacks and established a status quo on this part of the front that would last until the summer 1944. In Ukraine, the Russians were able to take the Korsun bulge. In Italy, battles raged in Monte Cassino and Anzo as the Allies were pushing towards Rome. 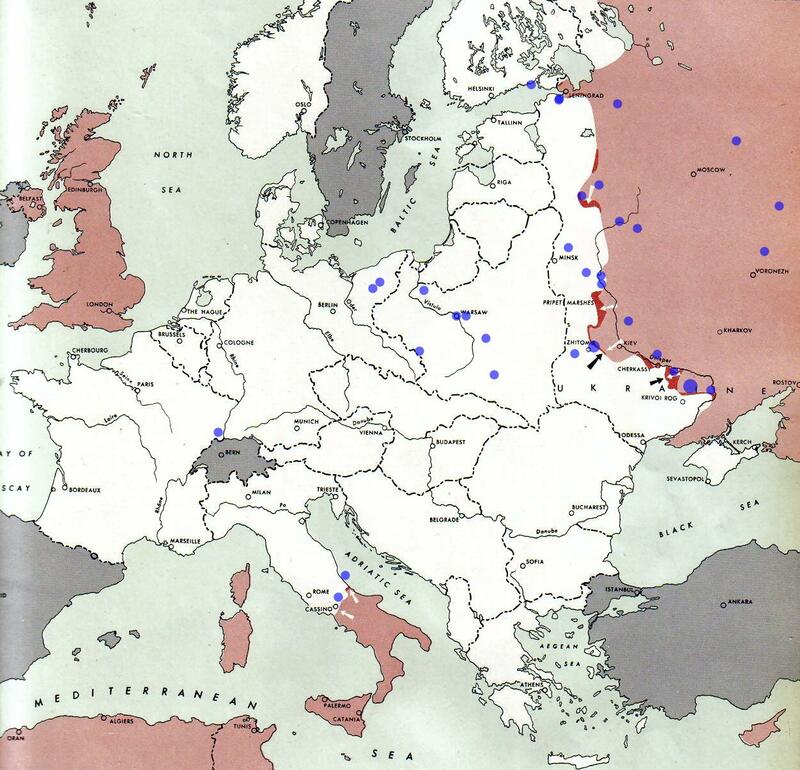 The Russians kept pushing in the North, trying to reach Narwa and Estonia. They conducted several small offensives in the region of Vitbesk, with heavy casualties on the German side. In Ukraine, the Russians finished chasing the Germans from the Korsun bulge. In Italy, the battles for Rome were raging. The Russians launched a series of attacks onto Narwa in the North, occupying the city of March 8th. In Ukraine, the Battle of the Kamianets-Podilskyi pocket (or Battle of Tarnopol) was a Russian effort to surround and destroy the Wehrmacht's 1st Panzer Army of its Army Group South. The envelopment occurred during the whole month of March. In Italy, the front was still static along the Winter line, south of Rome. The Russians managed to reconquer large territories in Ukraine, pushing the German back to the border with Romania. It should be noted that the Germans were able to escape the so-called Kamianets-Podilskyi pocket, in stark comparison with the disasters at Stalingrad (December 1942 - January 1943) and during the battles of the bulge of Korsun (January-February 1944). In Italy, the Allies had established a beach head in Anzeo, just South of Rome. On April 2, Russian armies attacked in the South of Ukraine and, by April 6, had driven the German and Romanian defenders past the Dniester River and isolated Odessa. Odessa capitulated on April 10, and Soviet troops began entering Romania proper. In parallel, on April 8, the Russians started the Crimean Offensive, also known as the Battle of the Crimea, as an effort to retake Crimea. 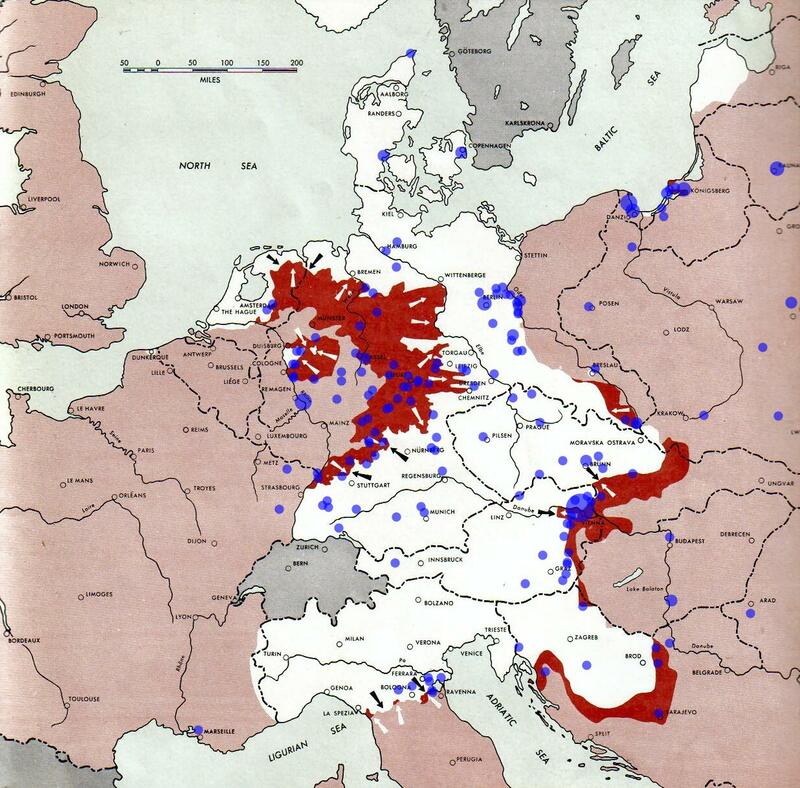 The reconquest would last untel May 12, when the last pockets of German resistance were destroyed. In Italy, the front was still static along the Winter Line, south of Rome. The different fronts remain mostly static during that period. The Russians were finishing the reconquest of Crimea, they had entered in Romania proper, and kept pushing toward Estonia. In Italy, the front was still static along the Winter Line. Beginning of May 1944 marks the end of the reconquest of Crimea. THe Germans had lost more than 30,000 troops during the corresponding battles. In Italy, the Allies launched their fourth, and final offensive on Monte Cassino, on the Winter Line. The major events end of May 1944 happened on the Italian front, as the Allies finally broke the German defenses along the Winter line and pushed towards Rome, which they would captured on June 4th. Near Leningrad, the Russians started on June 10 the Karelian offensive to put pressure on Finland (still at war against the USSR); they captured East Karelia and Viborg. In May-June 1944, the Iasi area in Eastern Romania became the scene of ferocious fighting between Romanian-German forces and the advancing Red Army; the city was partially destroyed. 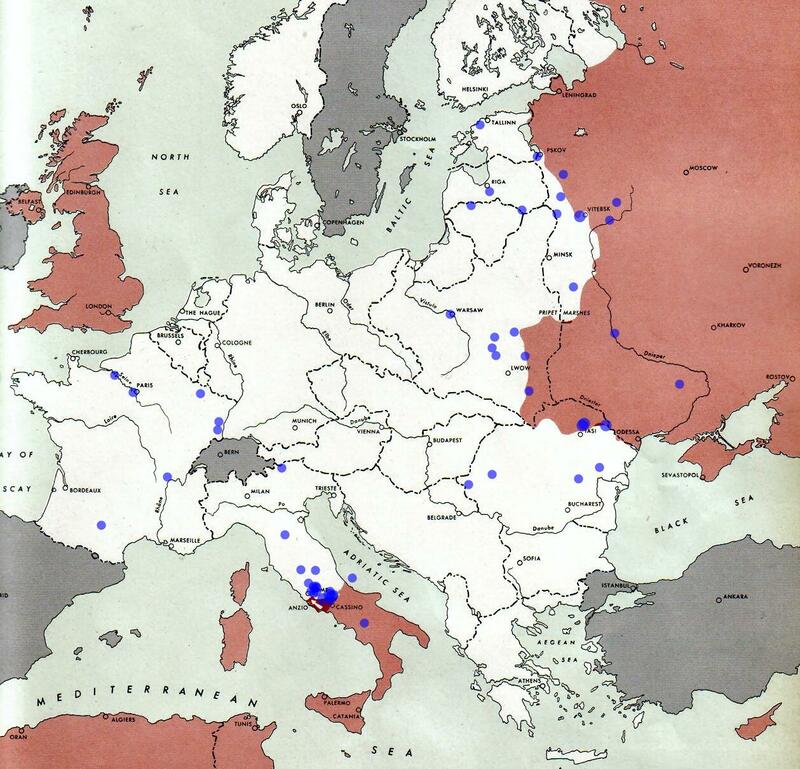 In Italy, the Allies, not that they had captured Rome, started pushing towards Northern Italy. The main even however during the first two weeks of June is the opening of the Western Front, with the allies debarking in Normandy on D-day, i.e. June 6th. The battles that resulted from this landing were fierce. Of significance, on 10 June 1944, the village of Oradour-sur-Glane in Haute-Vienne, South of France, was destroyed, when 642 of its inhabitants, including women and children, were massacred by a Nazi Waffen-SS company. This SS-company included 14 Alsatians, 13 of which were self-declared Malgré Nous. On June 22nd, the Russians started operation Bagration, also called the Belorussian Strategic Offensive Operation. This was a general attack by Russian forces to clear the German forces from Belarus. It lasted until August 1944, resulting in the destruction of the German Army Group Centre, possibly the greatest defeat of the Wehrmacht during World War II. In June, the Bagration operation included three main offensives, the Vitbesk-Orsha offensive in the region of Vitbesk, the Mogilev offensive, and the Bobruysk offensive, all in Belorussia (also called White Russia. In Italy, the allies were slowly moving North, while in France on the Western Front, fights was fierce in Normandy, with the Allies progrssing in small steps. The second phase of operation Bagration started on June 28. 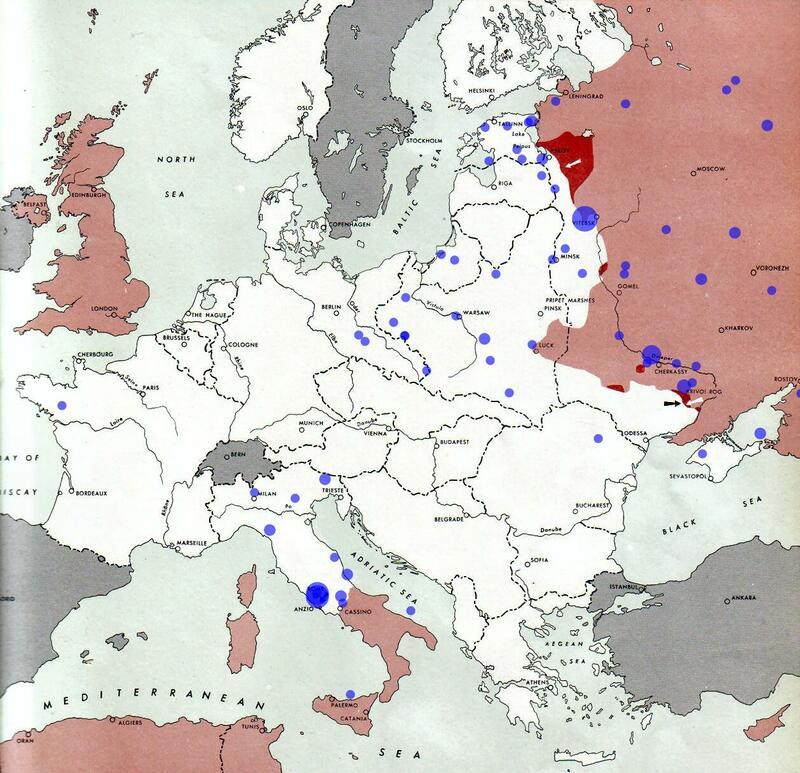 Its main single objective was the retaking of Minsk, the capital of the Belorussian Soviet Republic. The objective was reached on July 4th. The most significant element of that offensive however was that the German Army Group Centre lost close to 300,000 men. Still part of operation Bagration, the Russians started the Linius offensive on July 5th. It lasted until July 13, with a Russian victory and the city of Vilius being recaptured. In Italy, the Allies made steady progress going North. In Normandy, the Allies consolidated their beach heads, landing more trrops on the beaches that had been liberated. They encountered however severe resistance from the Germans. Following the successes at Minsk and Vilnius, the Russian armies kept pushing West as part of the Bagration operation. 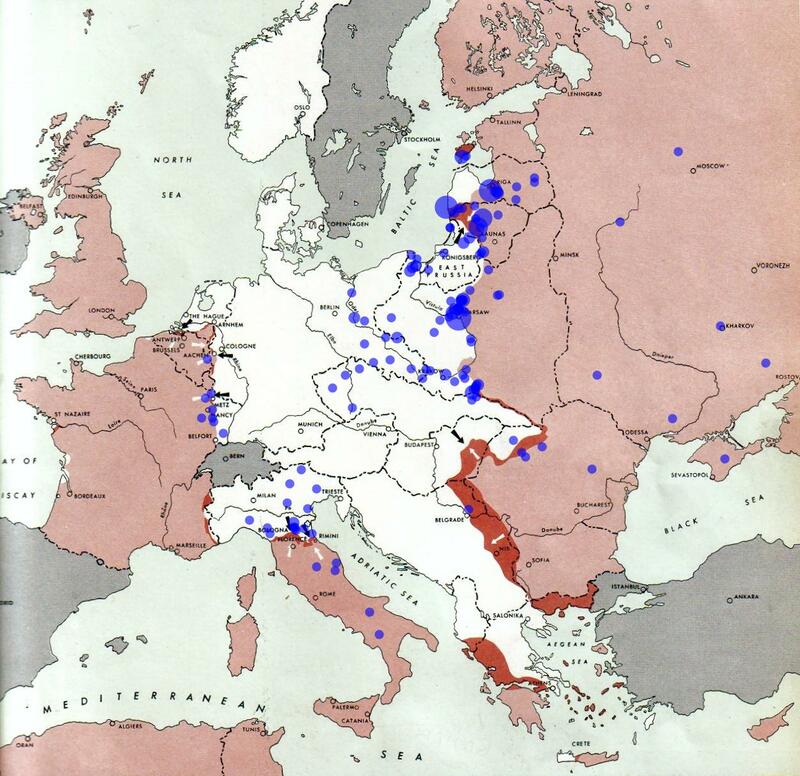 They launched multiple offensives on a long front from Estonia down to Northern Romania, advancing into Poland. In Italy, the Allies kept pushing North, taking the port of Ancona on July 18th. Battles in Normandy were fierce, with the Allies making limited terrain gains. The Bagration operation concluded mid August. During those last two weeks, the Russians engaged into more offensive, mostly the Kaunas offensive (that was retaken on August 1st), and the Osovets offensive, with the objective of the area of Osowiec in East Prussia. Germans however were able to stabilise their line of defence there (along the Narew river) that would hold until January 1945. Again, the Bagration operation was the greatest Russian victory in terms of numbers. The Germans lost about a quarter of their Eastern front manpower and would never recover from this. In parallel, the Germans lost many of their strongest units on the Western front in the Falaise pocket in Normandy, during the battle of Normandy. The battle of the Falaise pocket, from August 12 until Augist 21 was the decisive engagement during the battle of Normandy. In Italy, the Allies retook Florence. In addition to continuous fighting along the front line established at the end of operation Bagration, the Russians started a series of major offensive end of August as part of the battle of Romania. In the first stage, the Russians attacked through the territory of present-day Moldova, breaking and destroying the German Sixth Army. On August 23rd, King Michael of Romania led a coup d'Etat agains the ruling Primer Minister, that led to a new government that surrendered to the Allies and declared war on Germany. The German Eight Army retreated to Hungary, with heavy losses. After the battle of the Falaise gap (see early August), the Allies made fast progress on the Western front, taking Paris on August 25th. In Italy, the Allies reached the Gothic line, North of Pisa, the last major defensive line of the Germans. In parallel, they opened a new front in Southern France on August 15, as part of operation Dragoon. The Germans withdrew fast North, up to the region of Dijon (in Burgundy). Of significance during the month of September on the Eastern Front is the uprising of Warsaw that led to severe fighting between the Polish resistance and the German troops. 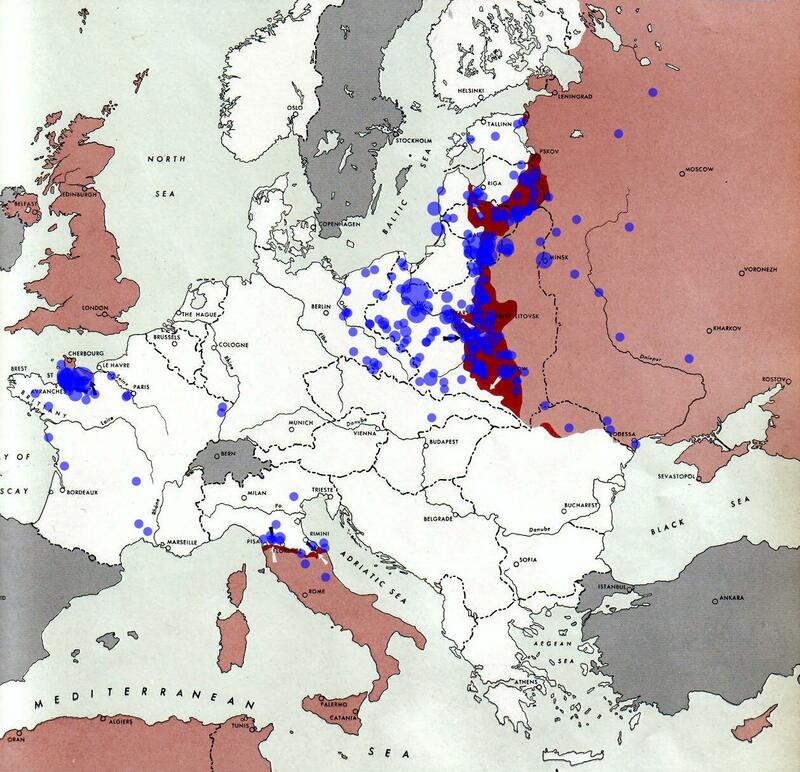 Through operation Bagration, the Russian armies arrived close to Warsaw. The Polish resistance started a major uprising in the city of Warsaw on August 1st. The uprising lasted 60 days.... it was severely repressed by the German troops, leading to a nearly complete destruction of the city. 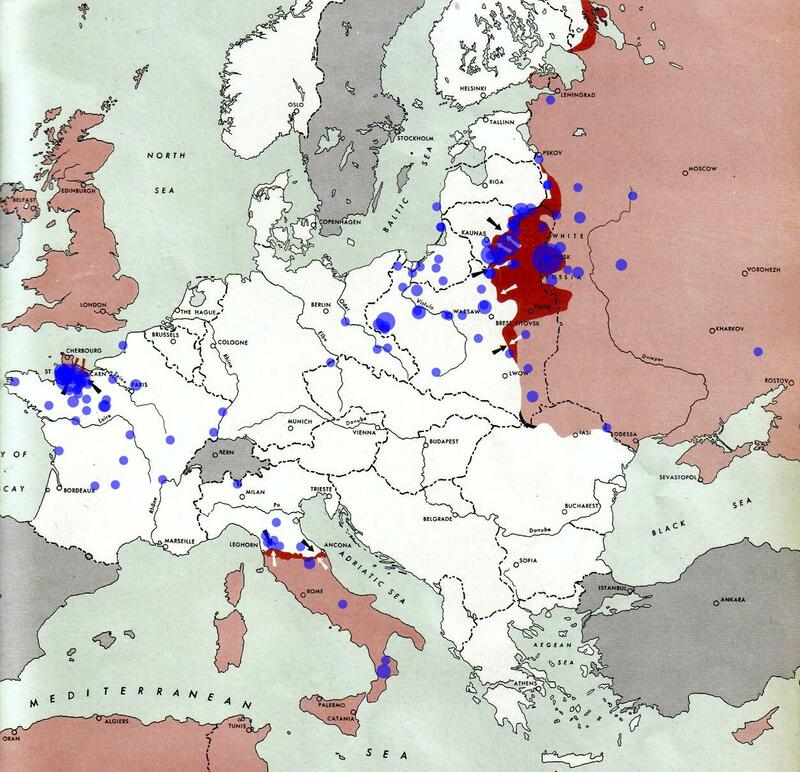 The passivity of the Russian armies that could have moved in and help the resistance is often discussed as being intentional, as a way to allow for the Polish resistance to be reduced. On the Western fronts, the Allies freed most of France and Blegium during that period, with the two fronts from operation Overlord (from Normandy) and operation Draggon (from South of France) rejoining. In Italy, the Allies were still blocked at the Gothic line, North of Pisa. During the summer 1944, the Russians conducted the large Bagration offensive that threw back the Germans from Belorussia to Poland. 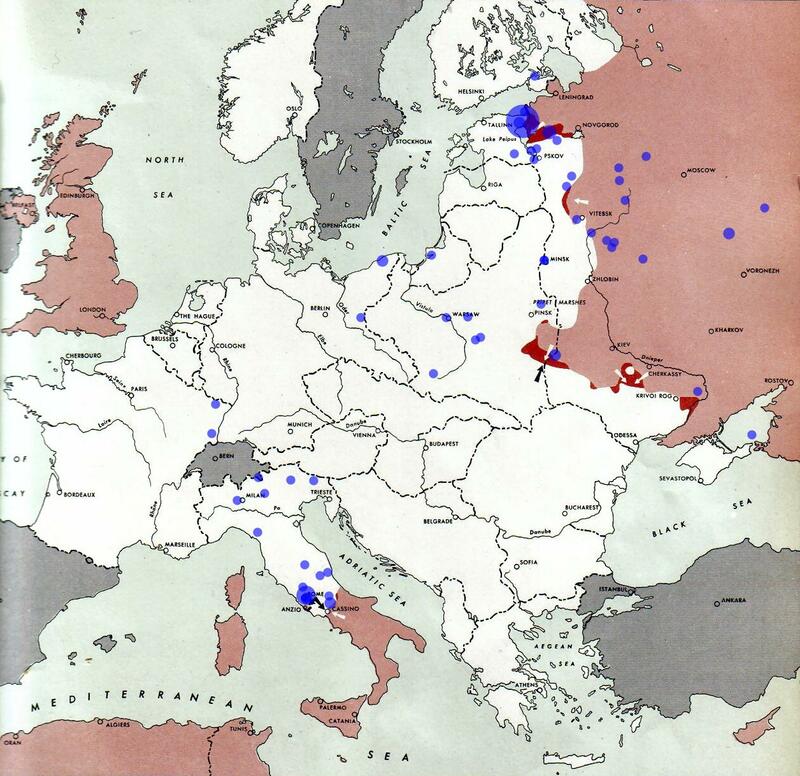 This created the opportunity for the Russians to attack towards the Baltic sea, resulting in the Baltic offensive during Autumn 1944. This offensive covered a series of operations, two of which two place during those last two weeks of September: the Riga offensive (14 September till 24 October) whose goals were to liberate Riga and the shores of the Gulf of Riga, and the Tallin offensive (17-26 September), to drive the German forces from mainland Estonia (Tallin was captured on September 22nd). OF significance during the same period is the Moscow Armistice of September 19th signed by Finland and the Soviet Union (and United Kingdom) that ended the was between the USSR and Finland. As a consequence, the Finnish army was required to fight and force the German Army to leave Finland. In Poland, combats were still intense in Warsaw. 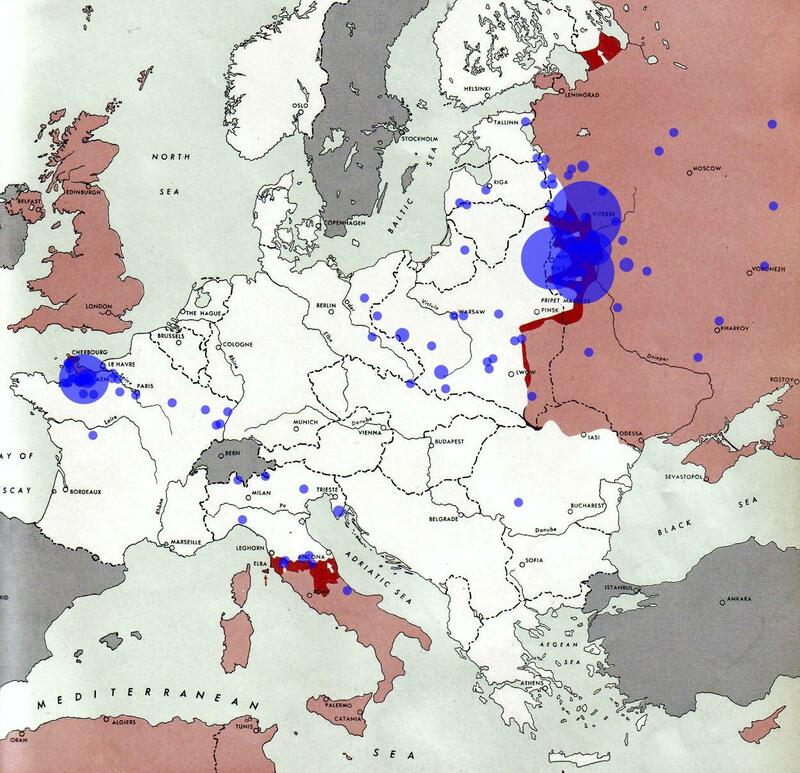 In the South, the Russians were pushing west, taking Sofia in Bulgaria on September 16th. On The Western front, the Allies have reached the Siegfried Line, the defensive line along the Western borders of Germany that was going all the way fron the Netherlands to Karlsruhe. Nancy is liberated on September 19th. In Italy, the Allies slowly moves North of the Gothic line, taking Rimini on September 18. On the Eastern front, the Baltic offensive saw the start of two major operations during the first two weeks of October: the Moonsund Landing Operation, geared toward the Estonian islands of Hilumaa, Saaremaa and Muhu, and the Mermel offensive, aimed at divind the different German army groups. Fighting between Germans and Polish resistance was still strong near Warsaw. On the Western front, the Allies liberated most of Belgium and had reached the Vosge mountains. In Italy, the Allies had pushed beyond the Goth line, but were making only slow progress due to strong resistance from the Germans. In the Baltic, following the Baltic offensive, the Germans regrouped on the Courland Peninsula in Latvia, and would stay there until the end of the war, despite multiple offensives from the Russian armies. 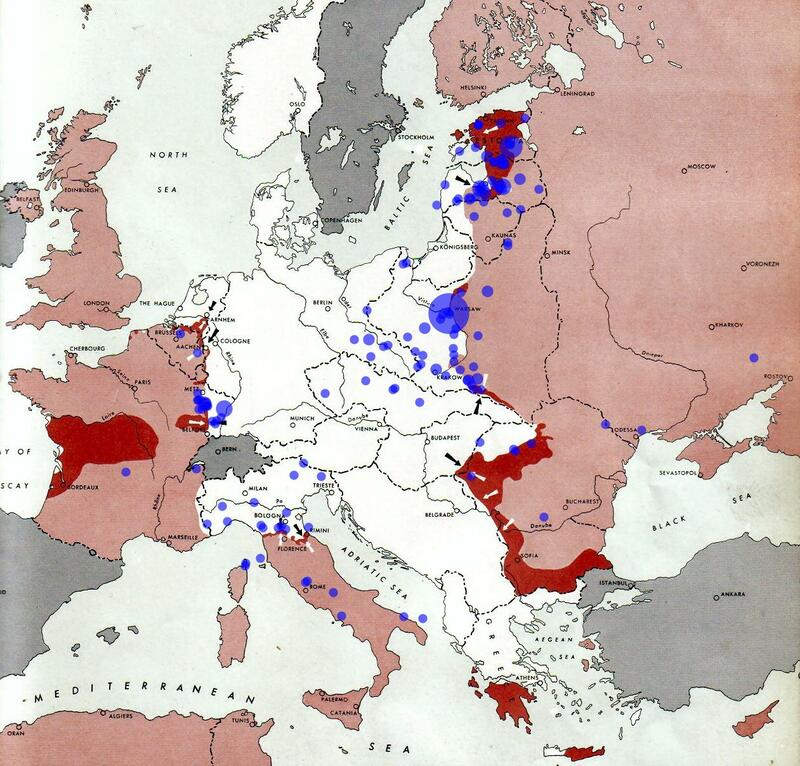 Among those, the Riga offensive, from 15 to 22 October, leading to the Russians taking Riga on October 13. On the Western front, the Allies starting an offensive to retake Metz, but met with fierce resistance from the Germans. On October 21, the Allies took Aachern after a week of fighting inside the city. It was one of the largest urban battles fought by U.S. forces in World War II, and the first city on German soil to be captured by the Allies. The battle ended with a German surrender. In Italy, fighting was fierce North of the Goth line. 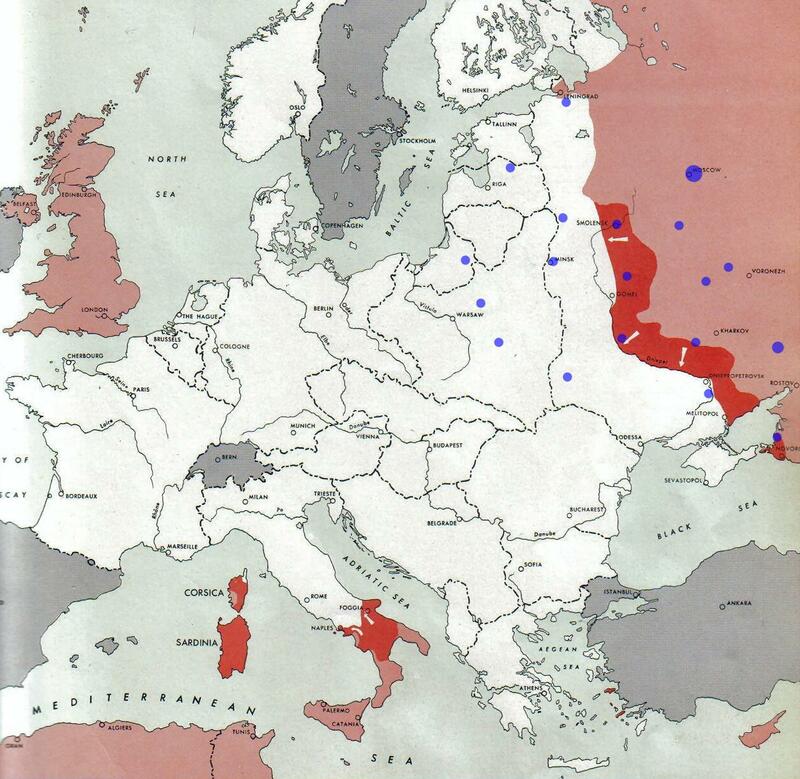 On the Baltic sea, the Germans had established a stronghold on the Courland peninsula, what would become known as the Courland pocket. 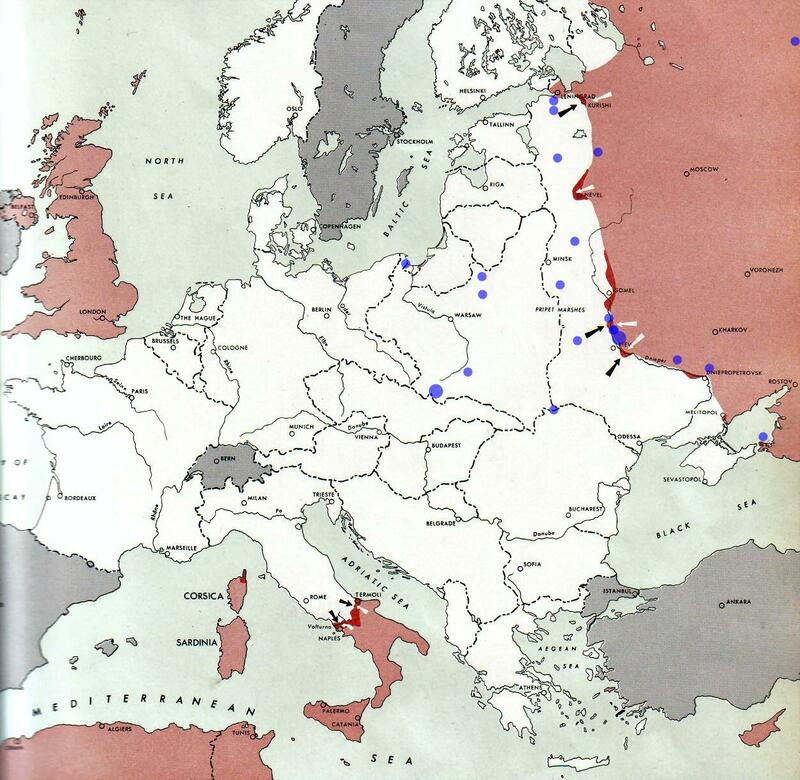 The Russians were still pausing on the Vistula, focusing on the Southern front. 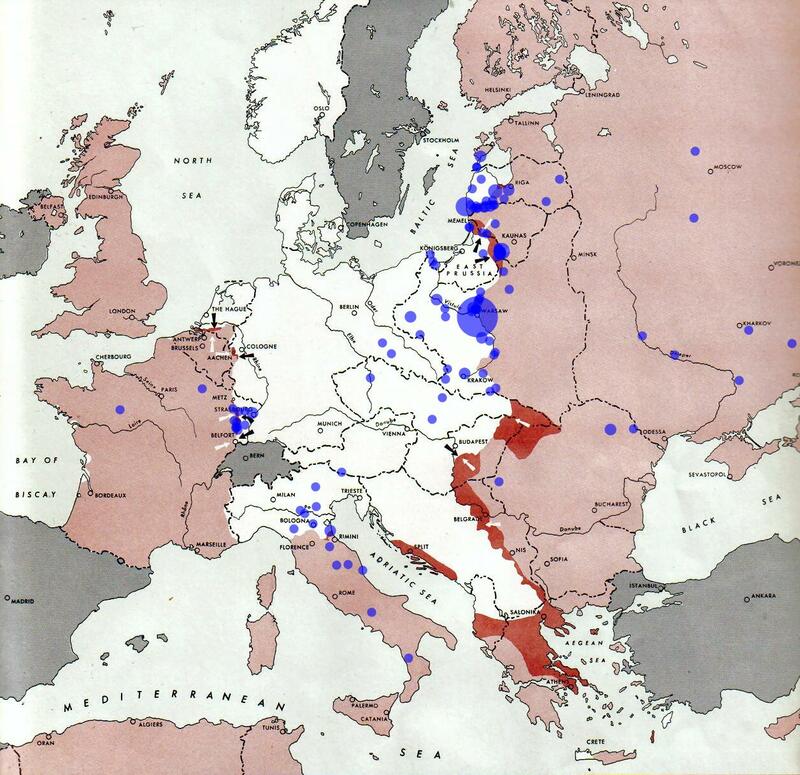 They had already occupied hald of Hungary and were moving forward in Yugoslavia. On the Western front, the Canadians took Zeebrugge on November 2nd, thereby completing the liberation of Blegium. The Allies completed the battle of the Scheldt (October 2 November 8th), with the main objective of taking the port of Antwerp, a key deep water port. The battle of Metz was still going. In Italy, the front did not change significantly. The war in Europe was mostly fought on the Western front during those two weeks. Metz is taken on November 23rd, after a month of intense fighting. The same day, Strasbourg is liberated by French troops led by General Leclerc. By the end of November 1944, the US Armies had pushed the Germans back across the Rhine and behind its own borders. The only remaining German units west of the Rhine in the southern region were around the Alsace city of Colmar, in the French sector. This is the so colled "pocket of Colmar". The war in Italy is at a stalemate, partly because of heavy rains. The first two weeks of December saw the end of the Battle of Hurtgen Forest in Western Germany, near the Belgian border. It was fought from 19 September to 16 December and was the longest battle on German ground during World War II. The main thrust during the first two weeks of December was for the Allies to reach the Rur River and capture its dams. 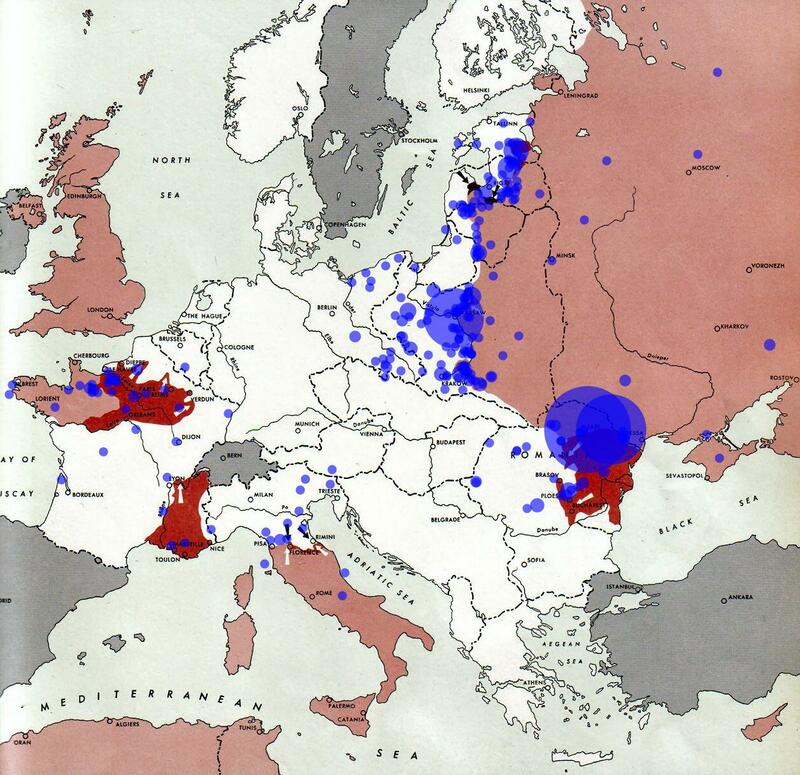 Military actions in this region between September 44 and December 15 brought death, injury or captivity to more than 250,000 soldiers from both sides. In ITaly, the Allies finally captured Ravenna on December 5th. The Battle of the Bulge (16 December 1944 – 25 January 1945) was the last major German offensive campaign on the Western Front during World War II. It was launched through the densely forested Ardennes region on December 16. The surprise attack caught the Allied forces completely off guard. American forces incurred their highest casualties of any operation during the war. The German intentions were to stop the Allies from using the port of Antwerp and to split the Allied lines. The battles were fierce, involving massacres (such as Malmedy and Chenogne) that are still under scrutiny today. 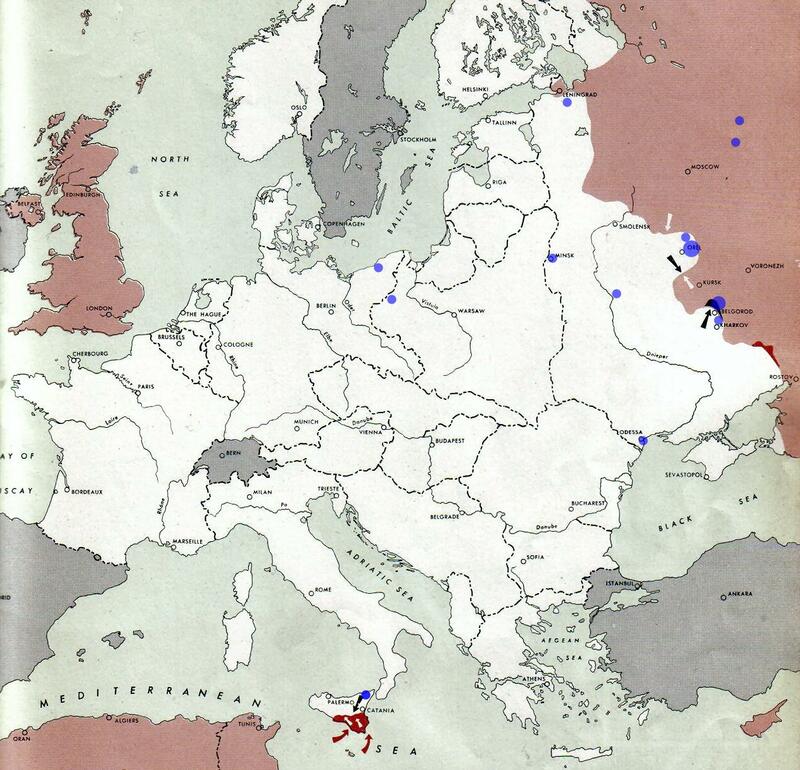 The Germans benefited from the bad weather in that region first, which would prevent the Allies airforce to intervne. The weather cleared un around December 23rd. The German advances were effectively stalled right after that. On the Eastern front, the siege of Budapest, also called the battle of Budapest started on December 26. It would last for 50 days, with the unconditional surrender of the city on February 13, 1945. On January 12th, the Russian army started the Vistual-Oder offensive in Poland. 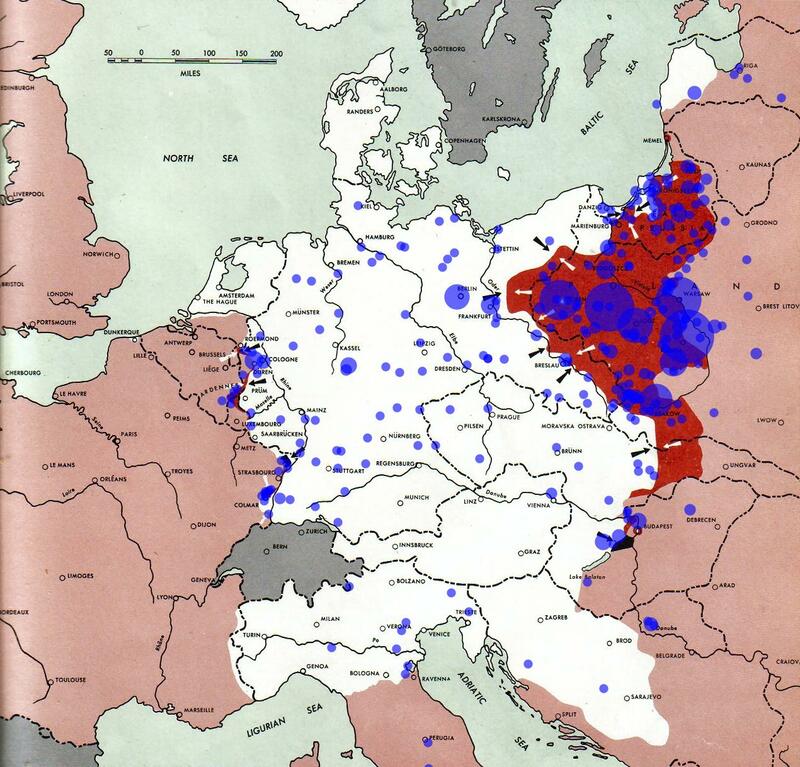 After a few months pausing along the Vistual river, during which they built up their strengths (it is estimated theat they had 5 times more troops than the opposite German armies), the Russians started their offensive toward Berlin, moving fast through Poland. They took Warsaw on January 17th, though the city was just rubbles after the severe fighting during the Warsaw uprisal by the Polish resistance during fall 1944. In the south, the battle of Budapest was still ongoing, while on the Western front, Germans and Allies were still fighting in the Ardennes, as part of the Battle of the Bulge. On December 31, 1944, the Germans started operation North Wind in Alsace and Lorraine to break through the lines of the Allies, retake the Alsatian plain and the Upper Vosges mountain. The operation lasted until January 25th, with a tactical withdrawal from the Allied forces. 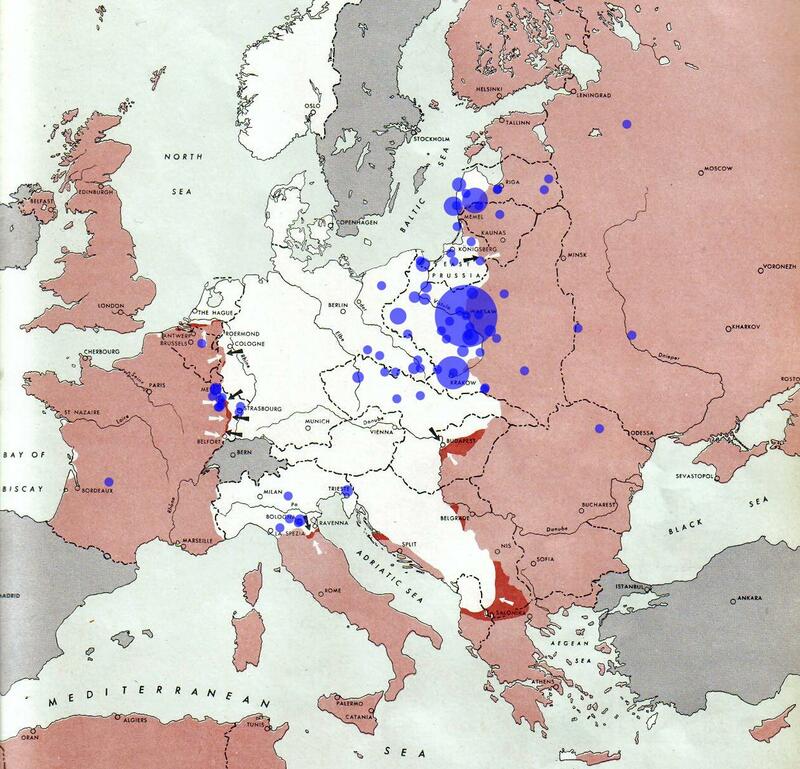 Over the two last weeks of January 1945, the Russian armies advanced 300 miles from the Vistula to the Oder, stopping at only 43 miles from Berlin. The reasons that the Russians decided to stop is still being debated. 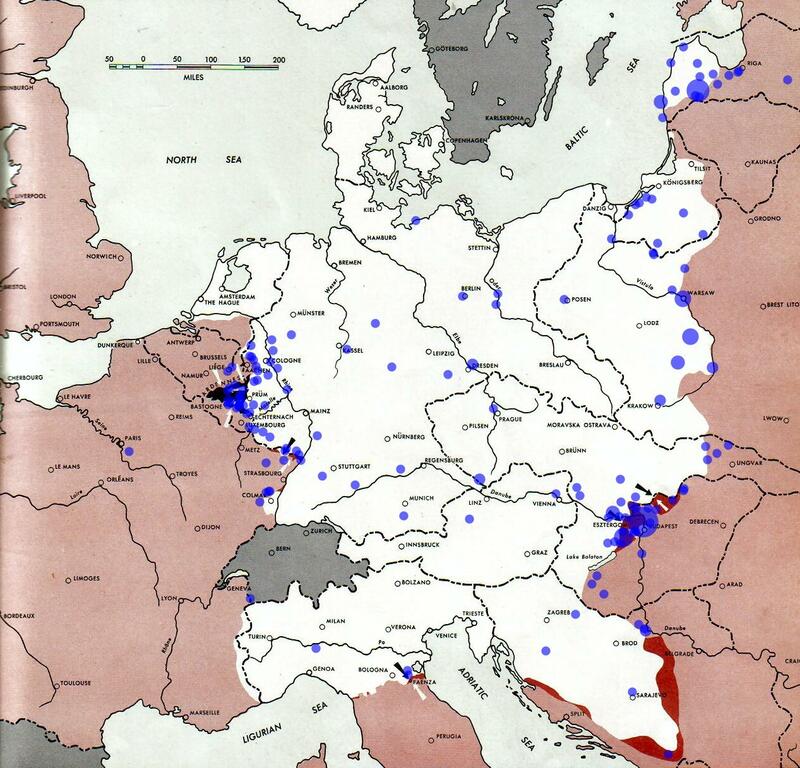 Their successes were consequences of both the Vistula-Oder and the East Prussian offensives. 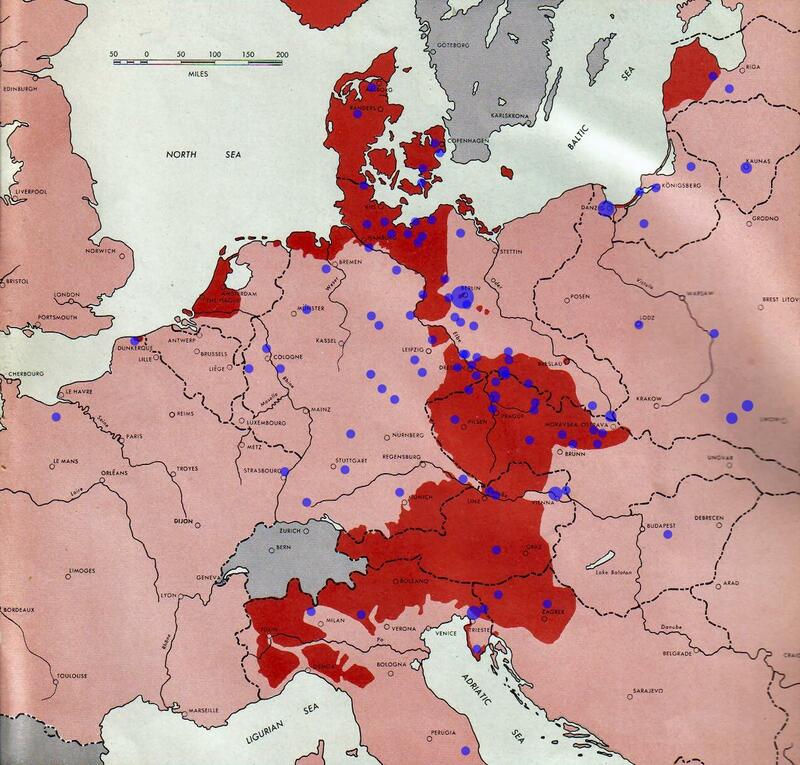 The reached and freed Warsaw on January 17 and Lodz on January 19. 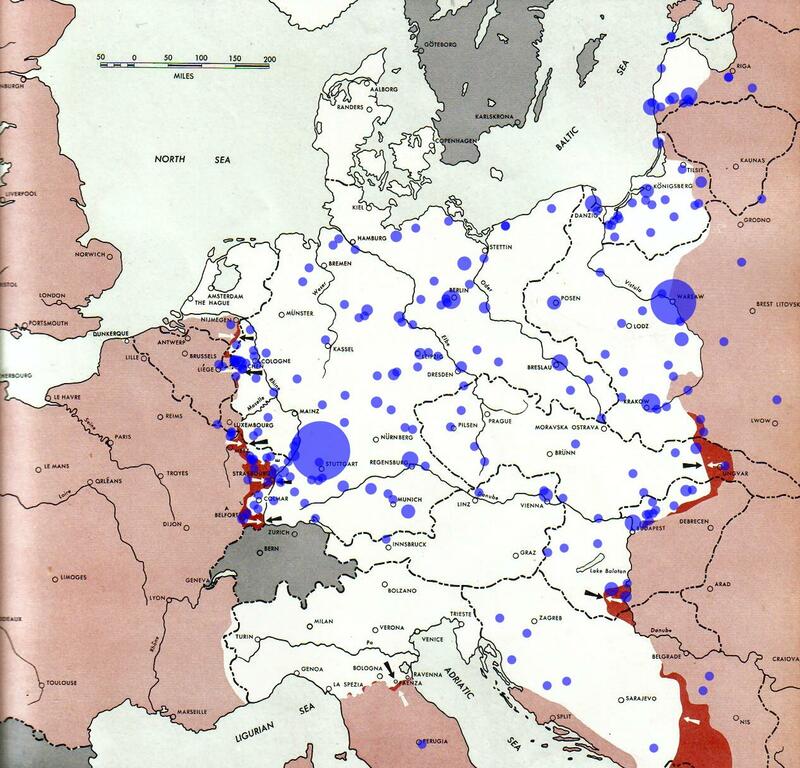 Some cities however in the path of the Russian advances led to strong resistance from the Germans, having been declared as "Festung" (German: fortresses, also strongholds) such as Poznan: battle of Poznan from January 24 till February 25. Of significance, on January 27th, the Russian army liberated the Auschwitz concentration camp, finding graphic evidence of the Holocaust. On the Western front, the Battle of the Bulge ended on January 25th. 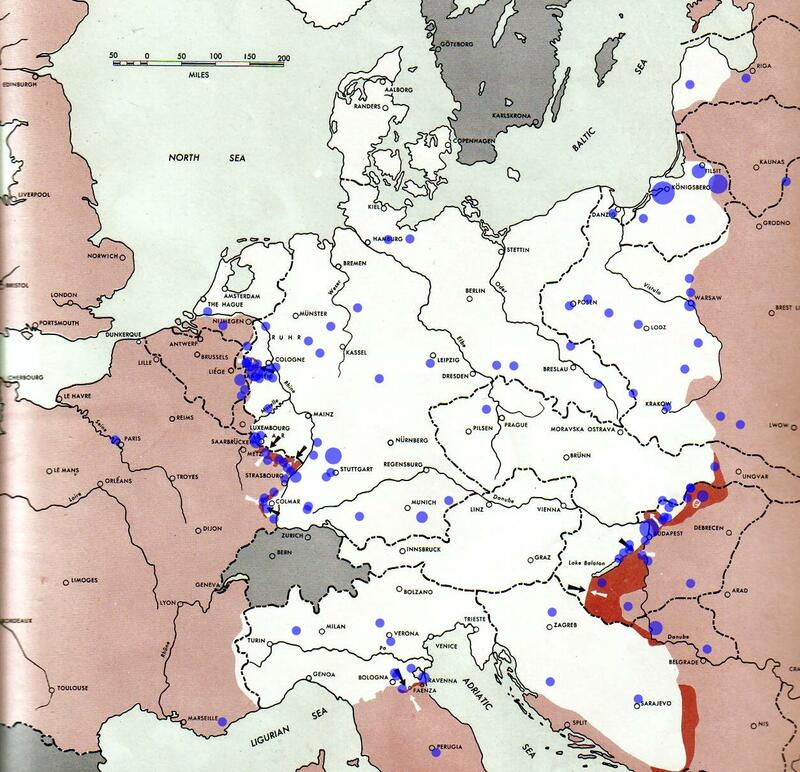 While the Allies won that battle, their plans to move inside Germany were delayed by 5 to 6 weeks. This battle exhausted however the German resources on that front, leading to a collapse of the Siegfried line. Early February, the Russians started their assault on the city of Königsberg (present day Kaliningrad). It resisted unly April 9th, 1945. On February 13th, the Russians started the siege of Breslau, another of Hitler's stronghold. The siege lasted until May 6th. After its fall, it was transferred to Poland. The remainning German defenders in the city of Budapest surrended on the same day, February 13th. The 5th battle of Courland started on February 12, but like all previous battles on the peninsula, it proved unsuccessful in clearing the Germans. On the Western front, The French First Army cleared the pocket of Colmar of all German forces. The fighting around Königsberg was fierce, the Germans attacking to maintain a land connection to the city that was nearly fully surrendered by the Russian forces. According to Russian sources, the Germans lost more than 40,000 men until early April when the city surrendered. The siege of Breslau was still going on. On the Western front, the Allies, after reaching the Rur river, were pushing towards the Rhine river, leading to the Battle of the Rhineland, during which the Germans lost many men (close to 300,000 prisoners). 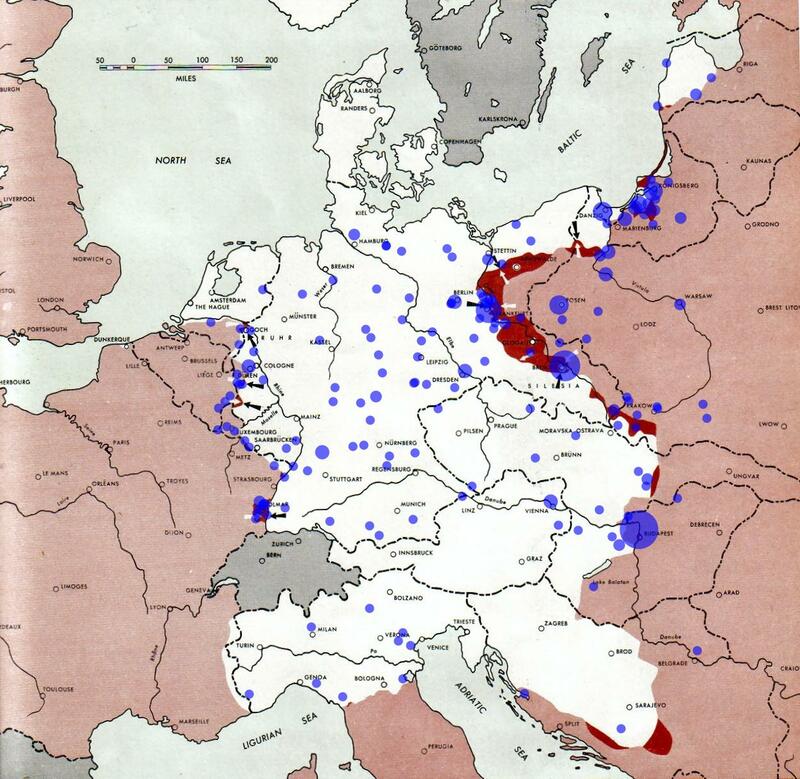 As the Russians had moved close to Berlin in February, they stopped their progrssion and instead focussed on clearing all German resistance from Pomerania, through the East Pomeranian Offensive. It lasted officially from February 10 until April 4. 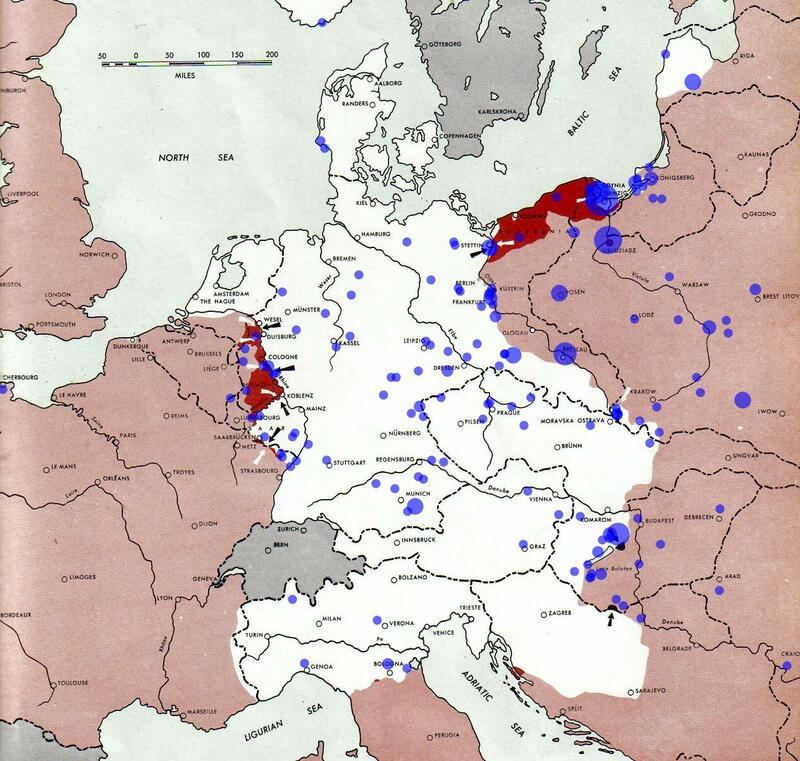 It included the offensive of Danzig, which the Russians occupied on March 30. On March 6h, the Germans started their last major offensice, call Operation Spring Awakening (Balaton Defensive Operation for the Russians). The attack was in Western Hungary, to defent the oilfields south of Lake Balaton, considered to be a crucial resources for the Germans. By March 15, it was clear that the operation had failed. 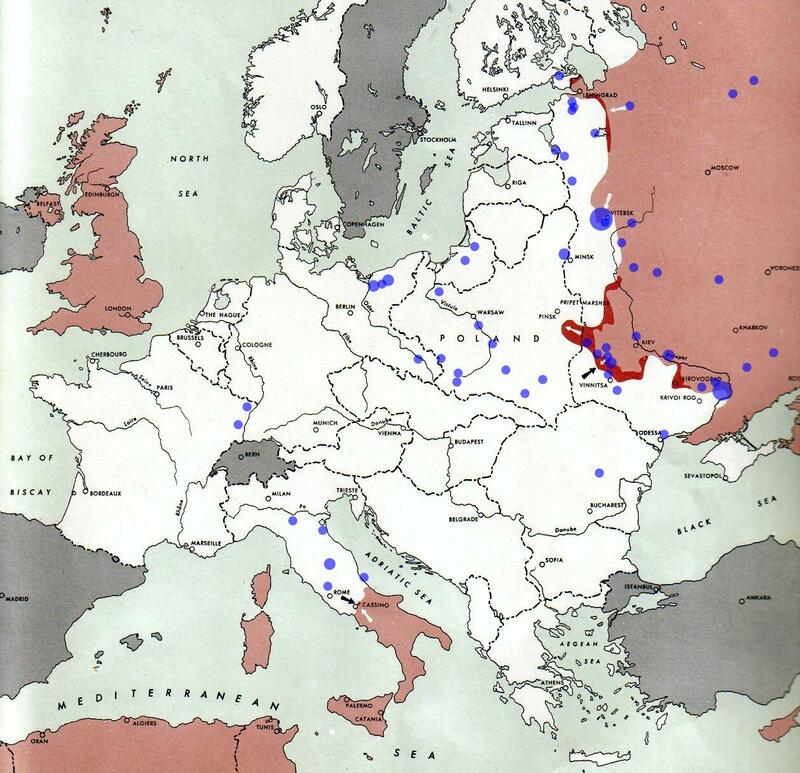 On the Eastern Front, the Russians concluded the East Pomenerian Offensive. They took Danzig on March 1945, and launched the Altdamm Offensive (18 March - 4 April) near Stettin. In the South, the Russians forces counterattacked in force on March 16 near lake Balaton; on March 30th, they had chased the Germans from Hungary and entered Austria, where they prepared for the Vienna Offensive. During those two weeks, the American and British armies on the Western Front crossed the Rhine river at four different spots. One of those crossings led to the Germans being trapped inside the Ruhr pocket, as part of Operation Plunder. The most Southern crossing was in the area between Mannheim and Worms. The final assault onto the city of Königsberg was given on April 6th and lasted on April 9th, when the German garrison surrendered. In parallel, the Russians occupied on March 30th a largely destroyed Danzig. Those two events concluded the East Pomaranian Offensive. 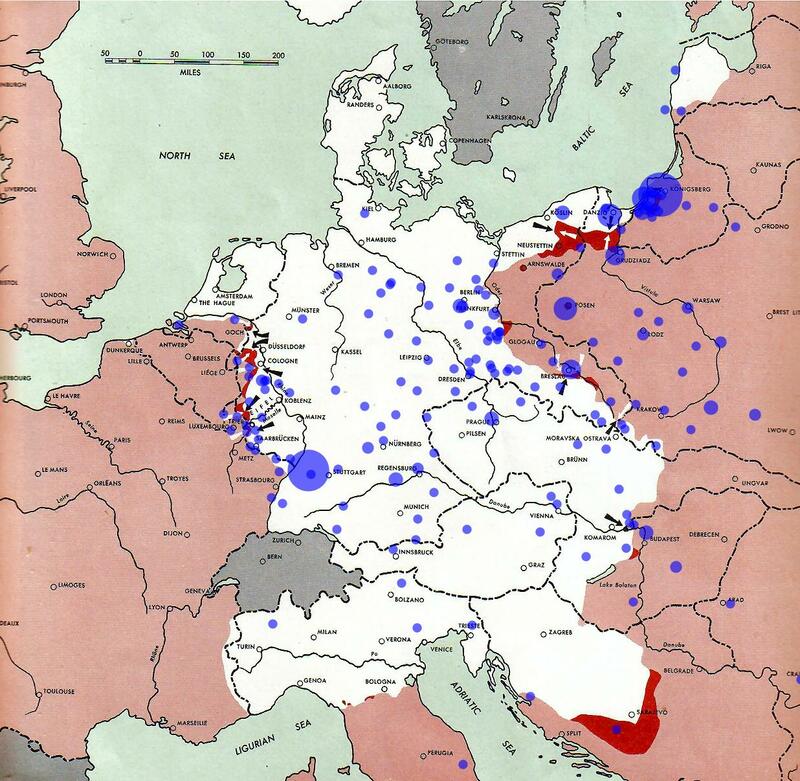 During the same time, the Russians launched the Vienna Offensive that lasted from 2 to 13 April, and ended with the capture of Vienna. On The Western front, the American British Armies closed the Ruhr pocket and started pushing East. 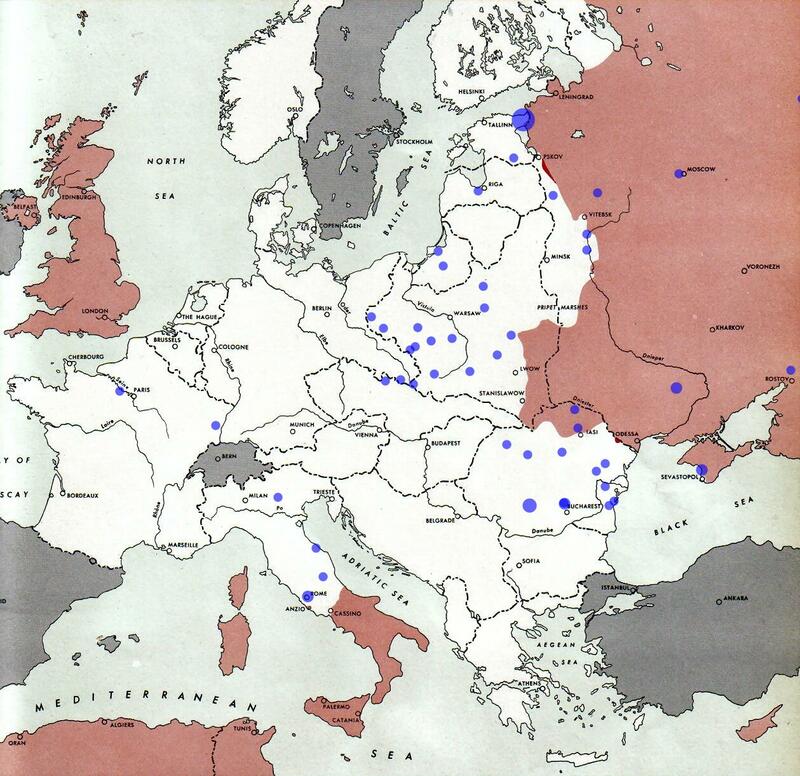 Their objectives were Berlin, considered to be a prestige and high cost objective, and Leipzig, where they were to make contact with the Russian forces. 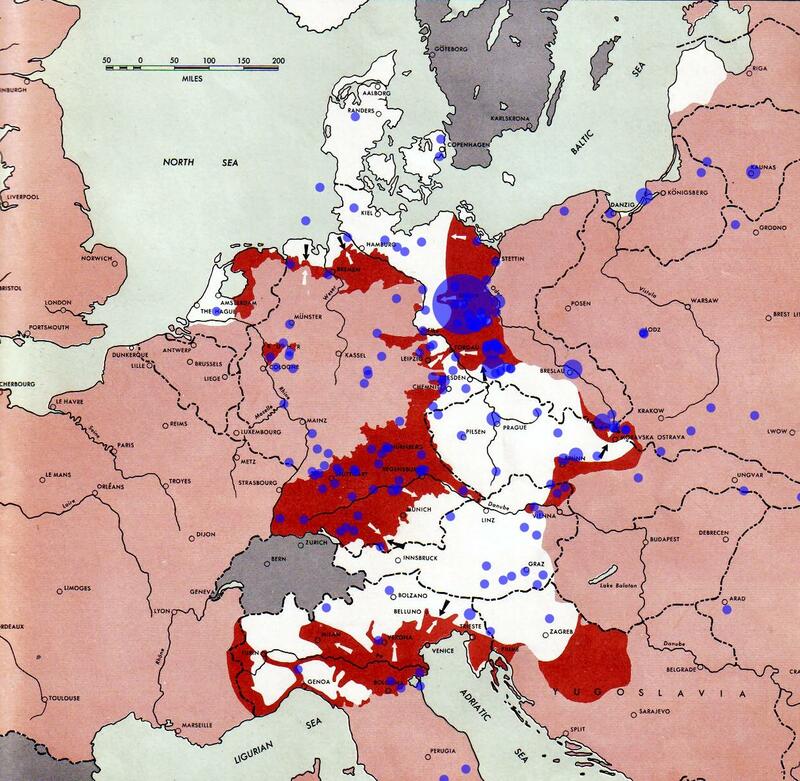 During those last two weeks of April, the Americans, British, and French pushed towards the South of Germany, reaching Munich on April 29th, and capturing it on April 30th. The main action however during those two weeks was the Battle of Berlin, part of the major Battle of the Oder-Nesse. Most of the fighting took place durung the Russian assault on the Seelow Heights. Fighting was fierce, with heavy casualties on both sides. 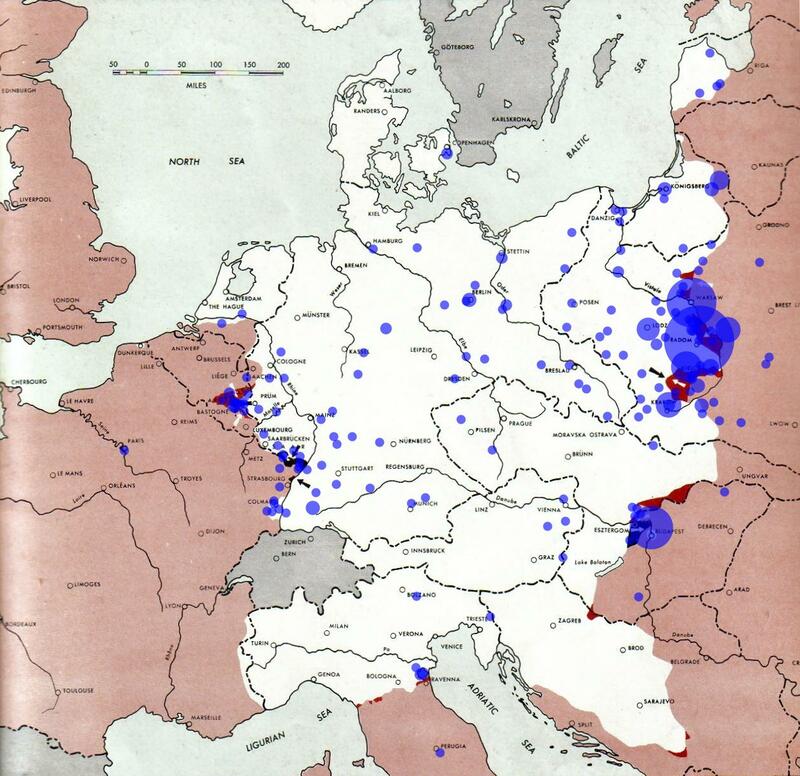 On April 20th, the Russians started bombarding Berlin Centre, and on April 23rd, they were entering Berlin. Fighting continued for another week. Before the battle was over, Hitler and several of his followers committed suicide. The city's garrison surrendered on May 2nd. The Spring 1945 offensive in Italy was the final Allied attack during the Italy campaign, starting April 6th and ending May 2nd. They took Bologna on April 21, Verona on April 26, and Padua on April 29th. 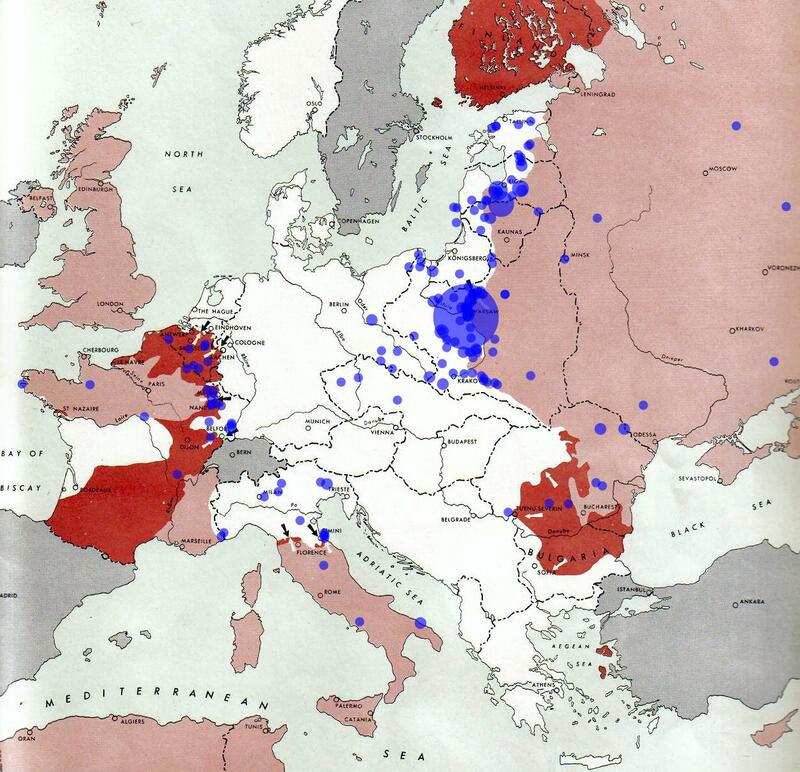 The Germans started negotiation with the Allies, not including the Russians, for a separate peace treaty. Hostilities formally ended in Italy on May 2nd. Of importance, Mussolini was captured by Italian partisans and executed on April 28th. During the month of April, the Western allies took more than 1,500,000 German prisoners, just on the Western Front and in Italy. May 1945 marks the endof the war in Europe. The Battle of Berlin edned on May 2nd. On May 4th, the German forces in North West Germany, Denmark, and the Neterlands surrendered. The same day, German forces surrendered in Bavaria. On May 5th, 1945, the Czech resistance started the Prague uprising and the following day, the Russians started the Prague offensive, that last major Soviet operation of World War II in Europe. The battle for prague was fought from May 6th till May 11th, i.e. after Germany had capitulated. German forces in Breslau surrendered on May 6th. On May 7th, General Alfred Jodl, signed an unconditional surrender document for all German forces to the Allies in Reims, France. The document stipulated that hostilities would end at 23hours on May 8th. The next day, Field Marshal Wilhelm Keitel and other German OKW representatives travelled to Berlin, and shortly before midnight signed an amended and definitive document of unconditional surrender, explicitly surrendering to all the Allied forces. The war was not fully over however for the Malgré Nous, as many were interned in prisoners' camps on the Western Front and in Russia, where they were mainly in Tambov. Many only came home in 1946 or 1947, with the last to come back in 1955.